Nosferatu: A Symphony of Horrors is one of the greatest horror films of all time and a classic of German Expressionism. It was filmed in 1921 and released in 1922. It stars Max Schreck as the Nosferatu vampire, Count Orlok. It was an unauthorized adaptation of Bram Stoker’s Dracula, because the studio could not afford the rights to the novel. Stoker’s family later sued, and a court ordered that all copies of the film be destroyed. Luckily, one copy of the print survived. It was the only production of Prana Film, a company founded in 1921 by Enrico Dieckmann and Albin Grau. The story is a framed narrative told by Thomas Hutter who lives with his wife Ellen in the fictitious German city of Wisborg (a combination of Wismar and Lubeck, two shooting site locations for the film). He works for a creepy little man named Knock, about whom many rumors circulate in the town. 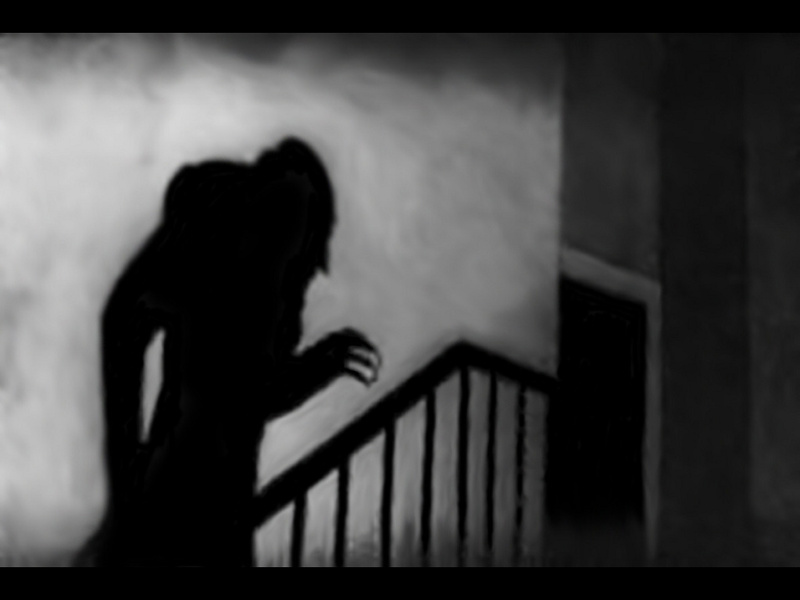 Knock sends Hutter on a long journey to meet a new client in Transylvania, named Count Orlok. Hutter entrusts his wife to a friend named Harding and Harding’s sister Annie, but his wife is skeptical of the trip. Hutter stops in the Carpathian mountains at an inn as he nears his destination. The people are horrified at the mere mention of Orlok’s name and they warn him not to go near the castle as a werewolf is on the loose (the creature shown is actually a hyena). In his room, Hutter finds a book about Nosferatu that frightens him.The next day, Hutter takes a coach that refuses to carry him any further past a bridge to the castle. A much darker, black-cloaked carriage appears to take him the rest of the way. Hutter is then greeted by Count Orlok and invited in for dinner. At dinner, Hutter accidentally cuts his thumb and Orlok pounces at his precious blood. Hutter goes to bed frightened of the strange count and awakens the next day to find an empty castle and two strange mosquito bites on his neck. He writes a letter to his wife to reassure her. 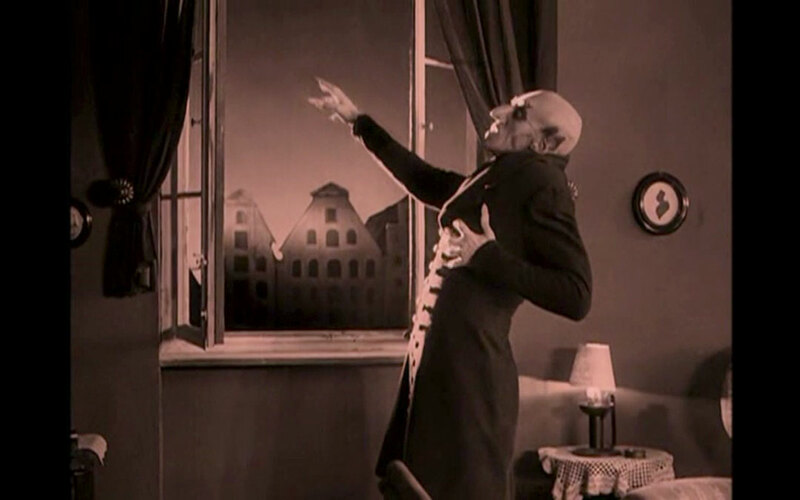 In the evening Orlok signs documents to purchase the property across the street from Hutter’s home, but Hutter begins to suspect that Orlok is a Nosferatu, a “Bird of Death.” He runs frightened to his room but there is no way to bolt his door shut and the door opens with Count approaching and Hutter falls unconscious with the famous shadow of the Nosferatu over him. The next day Hutter ventures down to the castle’s crypt where he finds the Count’s coffin –just as his book said the Nosferatu must sleep in the soil of his homeland- and he dashes back to his room and peers out the window to see the Count piling coffins into his carriage and he climbs into the final coffin before departing. Hutter, terrified and thinking of his wife Ellen, escapes out his window but falls to the ground injured and unconscious and awakens in a hospital. Upon recovering he hurries to return home and the coffins of the Count are shipped downstream and are transferred to a larger boat who are skeptical after they see rats crawling out of the coffins. One by one each of the crew members get sick and die, until just the captain and first mate are left alive. The first goes below to inspect the coffins and awakens the Count who scares the first mate into jumping into the sea. Orlok then kills the captain and sails the boat into the Wisborg harbor and leaves undetected with his coffin. Doctors visit the mysterious ship and after reading its logbook they conclude that the plague was carried by rats and the town is stricken with panic over the plague. Knock had been committed to a psychiatric ward but escapes after he strangles the guard. Meanwhile, Orlok watches Ellen through his new home’s window, and Ellen reads the book on Nosferatu against her husband’s wishes. The way to defeat a vampire or Nosferatu, according to the book, is for a beautiful woman to distract him all through the night. That night, she opens an inviting window for Orlok but Hutter thinks she has gone mad and goes to fetch Dr. Bulwer. While he is gone, Orlok enters, in another famous scene of his looming shadow, and drinks the blood of Ellen. He loses track of the time and as the sun rises he vanishes in a puff of smoke at daybreak near the window. Ellen and her grief-stricken husband embrace just before she dies. Murnau carefully constructed this scene using a metronome for the actors. The final scene portrays the ruins of Orlok’s castle in the Carpathian mountains. 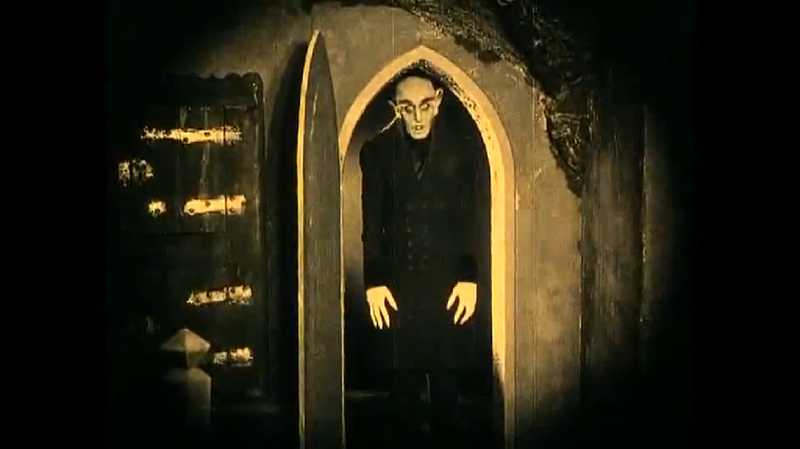 The character of Nosferatu is shown onscreen for a total of less than 9 minutes. Today, all the exteriors filmed in Germany are left intact in the cities of Wismar and Lubeck, and can be seen by visitors. Upon release, the film was banned in Sweden due to excessive horror and the ban wasn’t officially lifted until 1972. Nosferatu is the first great horror film that set the standard for all horror films to follow. Though the story is plagiarized from Dracula, Nosferatu is one of the greatest films of the silent era and was directed by one of my favorite directors, F.W. Murnau. Still today, in the contemporary age of flashy special effects, Nosferatu remains a chilling symphony of horrors.